7 LITRE FORD V8 WITH 7 LITRE BODYWORK, DRIVERS SIDE ROLL CAGE, ORIGINAL 15” HAILBRAND WHEELS FITTED WITH AVON ZZ TYRES, RECESSED MONZA STYLE PERTROL FILLER, ORIGINAL HANDBOOK PACK. AC cars are Britain’s oldest car manufacturer and began production in 1901. The first AC Cobra was produced in 1962 after Carroll Shelby approached AC in order to broke a deal to place Ford’s small block V8 in AC’s Ace chassis. The reason behind Shelby’s move was that he required a car that could compete against the likes of the Chevrolet Corvette in US sports car racing. The result was an immensely powerful roadster that was able to match Chevrolets Corvette on the track. The rights to both the ‘AC’ and ‘Cobra’ names were purchased by Brian Angliss in 1968 from Derek Hurlock along with original Thames Ditton production facilities and tooling thus enabling him to produce ‘continuation’ AC Cobras. This car is one 1 of 3 specially commissioned lightweight specification cars. It was built in 1992 by AC Cars LTD at Brooklands in Surrey and is fitted with a 7-litre ford V8 in 428 form. The 428 denotes the more road suited engine as opposed to the race tuned 427. As the car was one of only 3 lightweight cars built, the specification fitted to the car is unique and of a very high quality. The gearbox is a Ford top loader “Rug” 4-speed and comes with a Hurst shifter. The cars bodywork was made using the original bucks and jigs from 1965 so that the original rectangular lights and riveted bonnet scoop could be incorporated. Power from the 7-litre engine is approximately 400 bhp. The interior is fitted with original 1965 Mark III trim and the steering column, flick switches and steering are also original 1965 Mark III components. The wheels are original 15” Halibrand wheels with Avon ZZ tyres. The original handbook along with other technical information regarding the car is also available. 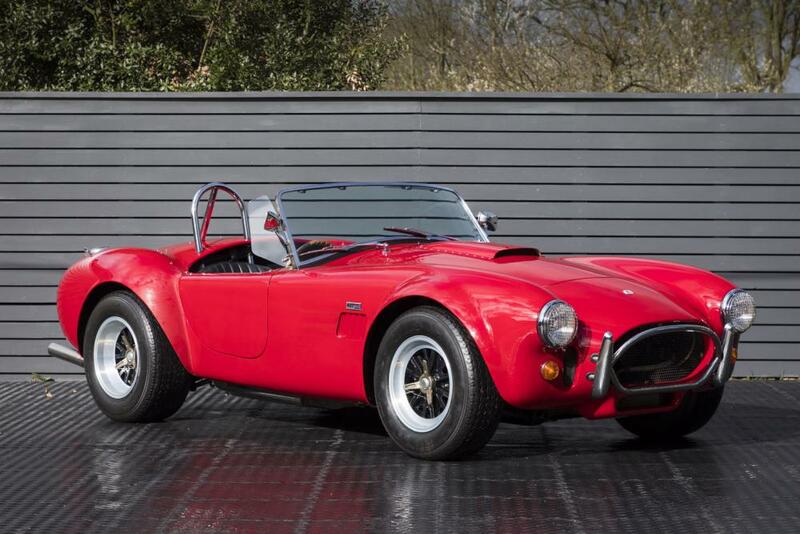 This is a great opportunity to acquire a very rare, 1 of 3 AC Cobra that took over 2000 hours to produce.